The Parallax View is a 1974 American thriller film directed by Alan J. Pakula and starring Warren Beatty, who was also a producer. The film was adapted by David Giler, Lorenzo Semple Jr and an uncredited Robert Towne from the 1970 novel by Loren Singer. The story concerns a reporter's dangerous investigation into an obscure organization, the Parallax Corporation, whose primary, but not ostensible, enterprise is political assassination. 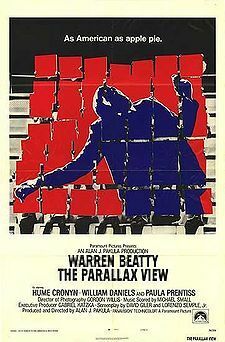 The Parallax View is one of a trilogy of thrillers directed by Pakula, along with Klute (1971) and All the President's Men (1976); The Parallax View was the only one not released by Warner Bros. Pictures.